The concept of real-time aircraft tracking has become a global issue over that past few years. Needless to say, aircraft position data has become a focus for ICAO and the airlines. Many hardware manufacturers are stepping up and generating solutions that utilize, in many cases, existing connectivity. Panasonic has one such a product and we thought our readers would find it interesting because it utilizes existing installed hardware. IFExpress had the opportunity to have a Q&A with Jeff Rex, Director, Panasonic Avionics Corporation about the new non-transponder-based aircraft position tracking service on offer. 1.Please name and describe the ground and airborne products involved in the Panasonic’s tracking solution. Our global tracking system is based on Panasonic’s Global Communications Services (GCS) and FlightLink™ satcom solutions. By adding the AirMap application to either of these satcom solutions airlines can meet the normal and abnormal tracking requirements proposed for the GADSS. Both flight tracking solutions provide a non-transponder-based aircraft position report available even in extreme remote and oceanic areas of the globe, either over Ku or a dedicated Iridium satellite data link. 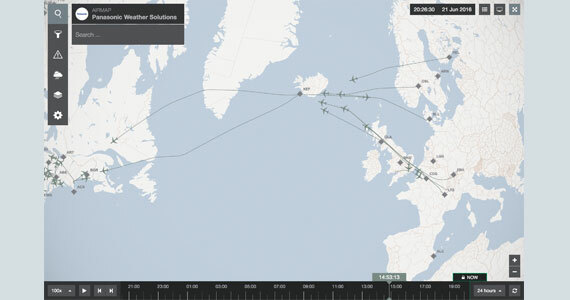 Each aircraft is monitored in real-time through a web-based tracking tool, called AirMap. 2. There are 3 issues we see – location data acquisition, transmission of the data (satcom, we presume), and ground handling of the data. Can you outline each solution? Aircraft position and identification data from either our FlightLink or GCS solution is sent to our ground based servers. AirMap is the graphical interface that provides a visual representation of the aircraft’s flight path, altitude, and location. It allows airlines to view and interact with this tracking data. It also generates alerts to support the GADSS requirements as well as satisfying other operational needs. The tracking interval is completely customizable to an airline’s requirements and is manually adjustable. When combined with the core satcom system, the application also offers support for voice and text messaging in the event that an airline’s ground operations want to communicate with the aircraft. For existing FlightLink and GCS satcom users no additional on-board equipment is required to activate Panasonic’s flight tracking solution. The only incremental costs are those associated with introduction of the AirMap application into the airline operations center. 3. Which is the lowest cost solution? We are letting customers know that if they have eXConnect or FlightLink, then they can have flight tracking for only an incremental fee. 4. The US FAA is working on this problem and has some recommendations. Does the Panasonic solution agree with their needs? eXConnect and FlightLink both meet the ICAO’s GADSS concept of operations. The standards and recommended practices specifications for both normal and abnormal tracking are still in development, and Panasonic will adjust our products as needed once released. 5. What are other valuable uses for Panasonic’s solution(s)? FlightLink is a complete end-to-end solution that includes multi-function atmospheric and GPS sensors, dedicated two-way satellite communication system and ground-based data management and quality assurance. It is compatible with all aircraft types and the communication architecture provides a two-way information exchange at any altitude, and even over the poles. In addition to flight tracking, FlightLink enables incredibly accurate and high-resolution weather forecasts, real-time icing reports, turbulence reports, and improved operational support for airlines through AOC communications to and from an aircraft. eXConnect is our global Ku-band broadband connectivity service. It covers 99.6% of all air travel hours and is installed on 1250 aircraft that fly routes all across the globe. Like FlightLink, it offers a two-way information exchange at any altitude. However, like all non-Iridium satellite solutions, it is not available over the poles. eXConnect is used for both passenger Wi-Fi and television services as well as for operational efficiency applications unlocked by the power of the connected aircraft. For instance, it enables real-time engine monitoring, telemedicine, live updates to EFBs and much more. 6. Is the solution, or portions of the solution, flying today? Our existing FlightLink and GCS satcom users will require no additional on-board hardware to use Panasonic’s flight tracking solution. The only incremental costs are those associated with introduction of the AirMap application. The current generation of AirMap tracking solution was launched in June 2016 and is currently being trialed by three airlines. Read the press release on this product. A) Each year, turbulence incidents cost airlines approximately $100 million due to crew and passenger injuries, unscheduled maintenance, operational inefficiencies, and revenue lost while planes are out of service. In fact, studies have shown that aircraft encounters with turbulence are the leading cause of non-fatal injuries in the commercial airline industry. The Weather Company, an IBM Business (NYSE: IBM) has announced a groundbreaking deal with Gogo Business Aviation (NASDAQ: GOGO) that will enable the delivery of real-time turbulence reports and alerts directly to pilots, dispatch and other operations personnel. Mark Gildersleeve, president of business solutions at The Weather Company, announced today at The Weather Company Aviation Conference that Gogo will be implementing Weather’s patented Turbulence Auto PIREP System (TAPS), a turbulence detection algorithm, on their aircraft-based communications server. The TAPS software will reside on Gogo’s server, which provides access to the necessary data generated by the aircraft to create reports of turbulence intensity. Gogo’s US-based air-to-ground and global satellite communication network is used to send the reports for immediate action in flight operations and weather forecasting. This is the first time a non-traditional system on the aircraft will be used to help enhance flight safety. Traditionally, flight operations personnel, pilots and aviation meteorologists received coded verbal reports with limited information on flight conditions, also known as PIREPS. Due to multiple reasons, including a lack of cockpit data connectivity, pilots were not able to get real-time updates. Using the Gogo network, pilots in the cockpit will now be able to access real-time turbulence reports and forecaster created alerts through Weather’s flight planning and operations applications and aircraft communication displays. “In this increasingly connected world, it’s no longer just about passenger connectivity, we have to consider all the other ways we can leverage the available technology to enhance the overall flight experience and improve safety – such as a connected aircraft,” said Andrew Kemmetmueller, vice president of connected aircraft services, Gogo. “Our ability to provide access to real-time data through our network will help pilots and operations teams improve flight planning, and ultimately, help airlines deliver the best in-flight customer experience throughout a flight.” In addition to real-time alerting, Weather will be able to leverage the TAPS reports to continually improve turbulence forecasts, the skill of Weather’s overall forecast model, and the WSI Total Turbulence solution. Some customers of WSI Total Turbulence have seen a reduction in turbulence injuries and unnecessary turbulence-induced maintenance inspection by about 50% each. The reports will also empower Weather’s team of 40 aviation meteorologists to alert clients of weather-related safety risks globally. The Weather Company, an IBM Business, is the world’s largest private weather enterprise, helping people make informed decisions – and take action – in the face of weather. The company offers the most accurate, personalized and actionable weather data and insights to millions of consumers and thousands of businesses via Weather’s API, its business solutions division, and its own digital products from The Weather Channel (weather.com) and Weather Underground (wunderground.com). The company delivers up to 26 billion forecasts daily for 2.2 billion locations. B) GOGO was selected by Delta Private Jets to equip its fleet of >70 business jets with Gogo Biz 4G inflight connectivity for 2Q17. Check out the full press release here. C) We note that the Iran/Boeing airplane deal at $25B will include new versions of the B737, B777-300ER’s, and B777-900’s. A deal with Airbus includes some 73 wide bodies and 45 single ails worth an estimated $27B! D) This study may explain aircraft Wi-Fi usage… be sure to check it out! E) Take the time to watch this movie on Boeing’s patent for their solar airplane, it is great and unusual! F) Thompson Aerospace is in the news! Santa Monica, CA and Frankfurt, Germany | June 14, 2016– AirMap, the world’s leading provider of airspace information and services for unmanned aircraft, and leading international airline IT provider Lufthansa Systems announced today a partnership to provide accurate, dynamic, and global airspace information to drone operators. “We are excited about this collaboration with AirMap. The market for drones is growing worldwide. With the Digital Notice and Awareness System™ (D-NAS), AirMap not only enables drone operators to integrate airspace data needed for safe flights, but also helps airports and air traffic authorities know where drones are flying. We are delivering the airspace and airport data relevant for commercial operations from our extensive database to increase safety around airports,” said Igor Dimnik, Director Products at Lufthansa Systems. AirMap recently announced the D-NAS to allow operators of unmanned aerial systems (UAS) to provide airports and other airspace stakeholders with real-time digital information about the location of their flights. In collaboration with the American Association of Airport Executives, over 100 U.S. airports are piloting D-NAS for increased UAS awareness. AirMap’s services provide recreational and commercial drone operators with real-time low-altitude airspace regulations and advisories, temporary flight restrictions, situational awareness, and more. These services are integrated into the drones and apps sold by leading drone companies, including DJI and 3DRobotics. The AirMap Software Development Kit (SDK) makes it easy for any drone manufacturer or application developer to include airspace information and services in their products.